A tenant moves out of a rental house. The house is renovated for the next lease, including new appliances. Thieves case the neighborhood, looking for empty, renovated homes. They pick a house and break in after dark, strip copper wiring and piping from walls, cabinets and various appliances to later sell. They may also remove new appliances. The result: thousands of dollars in damage and stolen metal, lost revenues, more blight, fewer tax dollars available for collection ... and one more eyesore in a neighborhood that doesn't need it. Copperstoppers is a program created under the auspices of CrimeStoppers of Memphis and Shelby County to help stop the thieves. Although some arrests and convictions have already occurred, it is going to take a lot of work - and neighbor and citizen cooperation - to be fully successful against the thieves, called "copperheads." An education and awareness campaign is under way in the community - to get people with first-hand knowledge of copper thefts to call CrimeStoppers with tips and to get awards - and various stakeholders are discussing other ways to fight the spread of the problem. How bad does it get when an empty, renovated house is invaded? One property manager reported to CrimeStoppers recently: "The last house (of ours) to really get hit was one off Tchulahoma. Basically, they stole EVERYTHING, and we now have it listed as a "down" unit. In other words, not worth the money to fix up because of the damage." That's the worst scenario for Memphis, says Buddy Chapman, CrimeStoppers executive director. 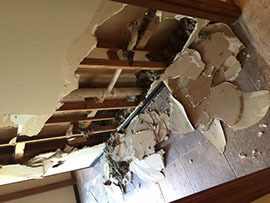 "If the thieves do so much damage that it costs more to fix than the building is worth, that's one more piece of property going to waste in our community and one more neighborhood reduced from what it once was and what it could be." 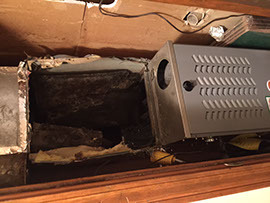 This damage was done by copper thieves to a recently-remodeled home in the Hickory Hill area.